Explore the highlights and hidden gems along the Regent's Canal, an 8.6-mile waterway that links Paddington Basin and Limehouse Basin in London, England. See London from a different perspective by taking to the water in a kayak. A 90-minute guided excursion with London Kayak Tours takes in all the major sights along the Regent's Canal including Camden Town, London Zoo, Little Venice, and Regent's Park. The tours are led by British Canoe Union instructors and are suitable for levels of experience including children 9 and over. This picturesque corner of London lies at the point where the Regent's Canal meets the Grand Union Canal. The waterways here are lined with colorful narrowboats and you can hop between cafes, bars, and restaurants at the water's edge. The streets in the area are home to beautiful Regency-style houses. Tuck into traditional Chinese dishes like dumplings and crispy Peking duck in the quirky surroundings of Feng Shang Princess, a floating restaurant in the Cumberland Basin of the Regent's Canal. This converted narrowboat was handcrafted in the 1980s and is decked out with authentic Chinese-style interiors. It's said to be one of Paul McCartney's favorite Chinese restaurants. Word on the Water is London's only floating bookshop. It's stuffed full of affordable books and hosts live music and poetry events up on the roof of a restored 1920s Dutch barge. It was saved from closure after a passionate campaign and is now moored permanently at Granary Square near King's Cross Station. 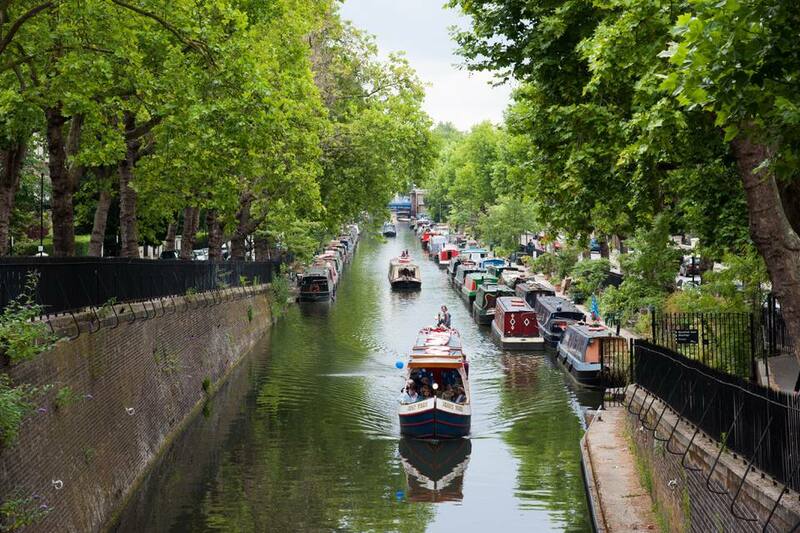 Ride the gentle waters of the Regent's Canal on a traditional narrowboat between Little Venice and Camden. The London Waterbus runs a regular service throughout the year (weekends only during the winter months) and the 50-minute journey sales past elegant waterfront mansions and through the Maida Hill tunnel. You can also buy a London Zoo ticket that includes a boat ride into the zoo itself as the boats have access to a canal gate right inside the attraction. Hipsters flock to this former glue factory turned bar at the edge of Victoria Park to sip spirits made in the on-site distillery. The bar is just off the Regent's Canal on the Hertford Union Canal and serves artisan cocktails made with its own brand of gin, vodka, and whisky. Swing by for a potent drink or to learn about boozy botanicals with a tour and a tasting. The Puppet Theatre Barge is an intimate playhouse in a converted barge in Little Venice. The 55-seat venue was founded in 1982 by the Movingstage theatre company and puts on regular puppet shows for children and adults between October and July. The barge is moored in Richmond between July and September. Learn all about the history of London's waterways at the London Canal Museum. Explore inside a narrowboat and learn about the people who have lived and worked on the canals throughout the years. The museum building used to be a warehouse that stored ice for a famous ice cream maker and dates to 1862. The museum runs regular Tunnel Trips, a guided narrowboat tour of Islington's long canal tunnel. Just off the Regent's Canal in Paddington Basin, the Rolling Bridge is a striking bridge with an innovative design that allows it to curl up into an octagonal shape. Created by British designer Thomas Heatherwick, the bridge is made of eight triangular sections that can roll up into an octagonal ball in order to let boats through. Every Friday at around midday it's unfurled for people to walk across.